MANILA – There’s no stopping the military from unmasking human rights group Karapatan and other communist front organizations. 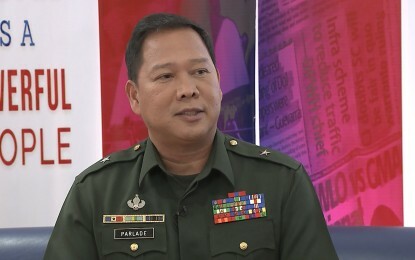 Major General Antonio Parlade, Jr, Armed Forces of the Philippines (AFP) Deputy Chief of Staff for Civil-Military Operations, on Saturday bared Karapatan has shown a clear pattern of bailing out arrested leaders and members of the Communist Party of the Philippines and its armed wing, New People’s Army (CPP-NPA). Aside from paying for the cash bond of arrested Romeo Nanta, head of NPA Regional Operations Command (ROC) Negros Island in 2012 and Zaldy Canete alias “Ka Jinggoy”, leader of NPA 1st Pulang Bagani Command, in 2015, Parlade said Karapatan - Northern Negros bailed out in 2012 Hernando Llorente alias “Ka Adoy”, NPA Northern Negros Front commander, and wife Faith Roseen Basergo alias “Ka Bea”, an NPA political instructress. “That's a clear pattern they have established and it doesn’t need rocket scientists to understand that,” Parlade said. He said it is “heroic” for former Karapatan – Southern Mindanao region secretary general Honey Mae Suazo, and Karapatan - Negros secretary general Fred Caña to have raised money to help bail out Canete and Nanta, respectively. “What a coincidence? Maybe Karapatan doesn’t know that they are telling the same pathetic story,” he said, adding that this is also the version of Karapatan- Northern Negros who raised money to bail out the Llorente couple. The Llorente couple were released from jail in April 2012 after a total of PHP80,000 bail was paid. Both were among those charged with robbery-in-band in connection with the 2011 raid of the fish farm of Joseph Edgar Sarrosa, a nephew of then Governor Joseph Marañon in Brgy. Bulanon, Sagay City. Records at the time of the couple’s release showed that more than P2 million has already been spent to bail out more than 10 arrested NPA leaders in Negros, who later rejoined the revolutionary movement to resume their armed struggle. “Ms. Palabay, where are you now? Honey Mae Suazo is appealing for pity now, saying she is a single mother after being separated from her NPA husband, Jonald Suazo,” said Parlade referring to Karapatan secretary general Cristina Palabay. “To establish how selective they (Karapatan) are as human rights defenders, let’s see how they can help the poor Mangyan relatives of Hanunuo tribal leader Jose Barera who was abducted and killed by NPA members led by Ka Mikoy and Ka Aira two days ago in Benil, Bulalacao, Oriental Mindoro,” he added. “Don't they know that they are directly aiding these terrorist organizations with their funding from Europe?” he said. He added that it’s about time that Securities and Exchange Commission (SEC) look into at all these CPP front organizations before other well-intentioned NGOs are dragged into this mess. “The 'Kamatayan Bloc' refutes this claim but they have been participating in this international assembly called by terrorist Joma in the last five assemblies,” he said, referring to the Makabayan party-list groups in Congress. “These include literacy, IP issues, women and children's rights, human rights, health, and even disaster resilience. No wonder they amass billions of pesos from European and Western donors, Parlade said.